In a career spanning over five decades, she has portrayed varied characters. Veteran actress #Tanuja_Mukerji says she always built a connect with a character through her heart and not the mind. "I am an actor. It's not about the character. When a subject appeals to me, then the role I am playing is at the right place at the right time. I feel it in my instinct and gut. I understand a character not through mind, but heart," Tanuja said on the set of upcoming TV show "Aarambh". The 73-year-old, best known for her roles in films like "Jewel Thief", "Haathi Mere Saathi" and "Anubhav", has made her TV debut with the historical drama. In the show, she will be seen as Hahuma -- a clairvoyant. "This show shows through visuals how a matriarchal society became patriarchal. There should be equality among humans whether it is a girl or a boy," Tanuja said. "Through this show, we are trying to bring in change. That's what our intention is, but right now I can't tell what change will there be in society. I am not Hahuma in real life," she added. 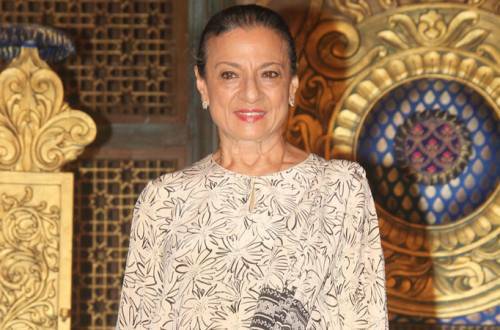 Tanuja said she decided to make her TV debut with "Aarambh" as she liked her character. "An actor basically prepares (for a role), when he finds it difficult. I managed to understand this character very well. When you go on set, that character gets into your body," she said. And she also mentioned that age is not a bar for her right now. "A shoot is a shoot. The dresses and dialogues are different, but it's all about shooting. So, mythological or a historical show hardly matters. I have a lot of strength," she said. Written by K. V. Vijayendra Prasad of "Baahubali" and "Bajrangi Bhaijaan" fame, "Aarambh" will narrate the clash of two civilisations -- Dravidians and Aryans -- born and built out of two different existential needs. Asked about the male dominated society of modern India, Tanuja said: "It is a duty of every individual to change his or her mentality. You need to do self-introspection. "We should think in our mind what we are saying is correct or not. Also, we need to listen to others. When this will happen, then there would be a change in the society." Besides Tanuja, "Aarambh", which will soon be aired on Star Plus, will also feature Karthika Nair, Rajniesh Duggall, Joy Sen Gupta and Hannssa Singh.